At an award-giving ceremony after a fixture like a cup competition final, the captain usually leads the team up to collect their medals. Any trophy won by a team will be received by the captain who will also be the first one to hoist it. The captain also generally leads the teams out of the dressing room at the start of the match. A captain is also tasked with running the dressing room. Captains may join the manager in deciding the starting eleven for a certain game. In youth or recreational football, the captain often takes on duties, that would, at a higher level, be delegated to the manager. A club captain is usually appointed for a season. If he is unavailable or not selected for a particular game, or must leave the pitch, then the club vice-captain will assume similar duties. A club may appoint two distinct roles: a club captain to represent the players in a public relations role, and correspondent on the pitch. Manchester United has had both of these types of captains; Roy Keane was the club captain on and off the pitch from 1997 to 2005 as he was a regular in the starting eleven, but his successor Gary Neville while nominally club captain from 2005 to 2010 had made few first team appearances due to injuries and in his absence other players (Rio Ferdinand or vice-captain Ryan Giggs) were chosen to captain the team on the field, such as in the 2008 (Ferdinand was captain as he was in the starting eleven, while Giggs was a substitute) and 2009 UEFA Champions League Finals, respectively. After Neville retired in 2011, regular starter Nemanja Vidić was named as club captain. São Paulo's Rogério Ceni is the player who has worn the captain's armband the most times (980 times, from 1999 to 2015, all playing for São Paulo). A vice-captain (or assistant captain) is a player that is expected to captain the side when the club's captain is not included in the starting eleven, or if, during a game, the captain is substituted or sent off. Examples include Thomas Müller at Bayern Munich, Marcelo at Real Madrid, César Azpilicueta at Chelsea, Sergio Busquets at Barcelona, Harry Kane at Tottenham Hotspur, James Milner at Liverpool and Ashley Young at Manchester United. Similarly, some clubs also name a 3rd captain or even a 4th captain to take the role of captain when both the captain and vice-captain are unavailable. In the 1986 FIFA World Cup, when Bryan Robson was injured and vice-captain Ray Wilkins received a two-game suspension for a red card, Peter Shilton became England's captain for the rest of the tournament. During the 2010 FIFA World Cup in South Africa, Germany had three captains. Michael Ballack had captained the national team since 2004, including the successful qualifiers for the 2010 World Cup, but he did not play in the latter tournament due to a last minute injury. Philipp Lahm was appointed captain in South Africa, but due to an illness that ruled him out of Germany's final fixture, Bastian Schweinsteiger captained the team for that game which was the third-place match. Lahm stated in an interview that he would not relinquish the captaincy when Ballack returned, causing some controversy, so team manager Oliver Bierhoff clarified the situation saying "Philipp Lahm is the World Cup captain and Michael Ballack is still the captain". Lahm ended up becoming the permanent captain of Germany until his retirement, as Ballack was never called up to the national team again. ^ Phillips, James (2 July 2018). "Brazil captains: The 16 players who Tite has made skipper of the World Cup favourites". Daily Star. Retrieved 5 February 2019. ^ "Captain". Retrieved 17 December 2016. ^ Association, The Football. "The website for the English football association, the Emirates FA Cup and the England football team". Retrieved 17 December 2016. ^ "Champions League Final 2012: Keane to see John Terry lift cup". 19 May 2012. Retrieved 17 December 2016. ^ "Smalling made Man United's third captain". ESPN.com. Retrieved 7 September 2018. ^ Abayomi, Tosin. "Gernot Rohr wants Super Eagles to perform without Mikel". Retrieved 7 September 2018. ^ Shaw, Chris (26 October 2018). "Klopp explains players' vote for captaincy roles". Liverpool F.C. Retrieved 26 October 2018. ^ "Lahm filling captain's role for Germany in word and deed". Retrieved 17 December 2016. 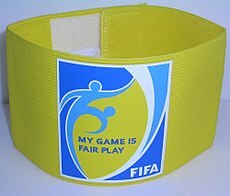 ^ "Perennial chokers Germany must beat themselves before Italy - Goal.com". 27 June 2012. Retrieved 17 December 2016.